You know how karma swirls in circles? You find yourself on the same block three times in one week. You run into someone twice in a single day, someone you haven't seen in months. Or...suddenly everyone is talking about drip irrigation. I don't take on a new client without a drip irrigation system. Most of my city gardens are in containers, and containers dry out more quickly than in-ground gardens. Water evaporates through the sides of porous containers and soil temperatures are warmer than those of in-ground gardens, which leads to quicker evaporation and transpiration. During the height of the summer heat, container gardens can need water every day, maybe several times a day, depending on the size and placement of the containers. Frankly this is way too much work for me, and it would be foolish for a client to pay me my hourly rate to stand there and water when a simple machine could do it without sweating or feeling resentful. Automatic irrigation is something I take for granted, but it's come to my attention that some people can't quite picture how drip irrigation works in a container garden. 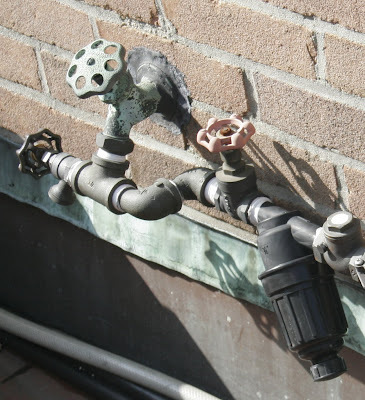 1) If you don't have a hose bib (spigot) on your terrace or back yard, hire a plumber to install one. Check with your building first to make sure this is allowed. 2) Attach a backflow preventer and a filter to the hose bib. The backflow preventer (sometimes called an anti-siphon) keeps contaminants (fertilizer, dog pee, etc.) from travelling back into the plumbing of your apartment or home. This is required by law in most states and is generally a good idea everywhere. The filter prevents particulates from passing through the system where it might clog thin hoses and emitters. In the image below, the filter is the black, grenade shaped appendage appearing just right of the red faucet. 3) A pressure regulator may also be necessary to reduce the water pressure running through the irrigation system. Drip irrigation systems generally operate at 20-30 psi (pounds per square inch), which is lower than the water pressure of most residences. The pressure regulator insures that great rushing streams of water don't rip apart your newly installed system. 4) Next come the solonoid valves. You'll need a valve for each zone of your garden (the above set-up shows 3 solonoid valves). These remote control valves are opened and closed by an electric timer/controller (we'll get to that in a minute). A large terrace might need different zones for areas with varying water requirements: sunny and shady areas, small window boxes and large mixed containers. With different zones you can give your sunny, small window boxes 8 minutes of water twice a day, while giving your large, shady containers 20 minutes once a day...get it? 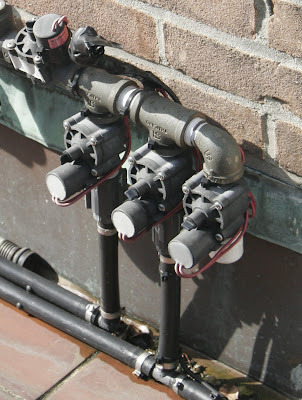 5) PVC (or polyethylene) piping comes after the solonoid valves and runs around the perimeter of the terrace, attached either to the walls, or to the parapet, against which the containers are arranged. 6) 1/4" tubing, sometimes called spaghetti tubing, is attached to the PVC piping and ends with an emitter. There are many different kinds of emitters (some pressurized, some not), all of which deliver water SLOWLY (that's why they call it DRIP irrigation) and efficiently, directly to the soil surface. In early spring the spaghettis may be visible, but once the plants grow in, you won't be able to see them. Go ahead, find the spaghettis in this picture. The whole magilla is controlled by a timer (either battery operated or electric) which is wired to the solonoid valves, telling them when to open and close, controlling how often and how long the plants are watered. The timers are programmable and can be adjusted as watering needs change during the season. You can also attach a rain sensor to avoid irrigating when it's pouring, as it has done with depressing frequency this summer in NYC. This all probably sounds much more complicated than it really is. Truth is you can buy kits that contain most of the essential parts pre-assembled (backflow preventer, filter, pressure regulator, and valve(s)) and simple, battery operated controllers are available at big box stores. Or you can call an expert for a professional (albeit somewhat more expensive) installation. Either way, don't be put off by the initial cost. It's a lot cheaper than paying someone to water all season along, nor will you be spending oodles of $$ to replace the plants that died because you went on vacation and your neighbor didn't water properly. Automatic irrigation is also a lot more dependable (as long as the system is actually turned on, right O.E.?). Drip is efficient since no water is wasted by flinging it willy-nilly through the air (like a sprinkler does), nor will standing water collect on leaves and flowers where it may encourage fungal diseases. So what's stopping you? Drink up. Great post. I like drip, ever since I learned how to install it years ago. Setting up the piping and spaghetti tubing is easy. What I don't like are overcomplicated timer/controllers that seem like they are designed to confuse. Many homeowners don't know how to use them if they were set up by someone else. Maybe they're better now? Hi NYCG, It's true, there are some timer/controllers that can make your head spin. But there are also simpler models too, including battery operated timers that don't require an external electrical outlet. Most homeowners would probably be fine with a single zone setup, although I like having multiple zones so I can tailor the amount of water to the plants' needs. Do you use drip in your own garden? If so, do you turn it off and on by hand? What about when you're away?